The writers are coming the writers are coming the writers are coming!!!!! It's October 1...and what does that mean?! 31 day until National Novel Writing Month!!!! And the day John start stocking the bomb shelter with 30 days of supplies and investigates how to get our internet connection down there. And yes, we really do have a bomb shelter. I should show you sometime. This will be my 6th year of writing madness. And hopefully, fingers crossed my 5th year in a row of winning. I'll be spending this month working my way through my copy of "Ready Set Novel" to prepare. YAY for preparing for once. Oh yeah...I will be doing this while still working on my MatadorU travel writing course. So...this could be interesting. Or fun. Or a really bad idea. Not sure yet. We shall see. I get the sense if you're new here you have NO IDEA what I'm talking about. So let me explain...no let me sum up. You have 30 days to write a 50,000 word novel. Which is the average length. About 175 pages. You have until 11:59 pm on November 30. You can plan to your hearts content. Or not plan at all. As long as you don't write any part of the actual novel until November 1. I mentioned I have "won" NaNo. Yeah you don't actually win anything other than a round of applause from everyone who failed to win and a printable certificate from the NaNo website. Oh and you win the knowledge that you did something most people haven't. I still cherish the first year I won NaNo and that Monday I was at Starbucks getting coffee on my way to work. The nice barista asked me about my weekend and I said, "I finished writing my book!" Do you have ANY idea how cool it is to say that!? So cool. The barista was so impressed my coffee was on the house! YAY! Wrote a book AND free coffee! Here's the thing. Whatever you write during the 30 days and 30 nights of writing madness will probably be more the quality of 50 Shades of Grey then Voltaire but the point is to get that book that has been banging around in your head out. It's a great chance to write a rough draft. You know that little book called "Water for Elephant"...you know...the one that was turned into a movie...that little book...yeah...rough draft written during NaNo. Awesome!! Now I'll be honest, nothing I've EVER written during NaNo will probably see the light of day. Maybe bits and pieces at some point but nothing ever in its entirety. Because lets be honest I have entire chapters devoted to one of the characters cats or a conversation about bird watchers monthly magazine. Some of my plot twists are based on dares from the NaNo forum. But over the last 7 years I've had a lot of fun and met some amazing people. Seriously. Last year I met Jo. At a Starbucks in Bern. She was from Winnipeg. A piece of home in the middle of Switzerland. She's repatriated back to Canada now but I know our paths will cross again. They have to. We're Winnipeggers...they get every where. Here's hoping the same thing happens this year! Still not sure what I'm talking about? Check out The National Novel Writing Month for more details and to sign up for this epic literary adventure. 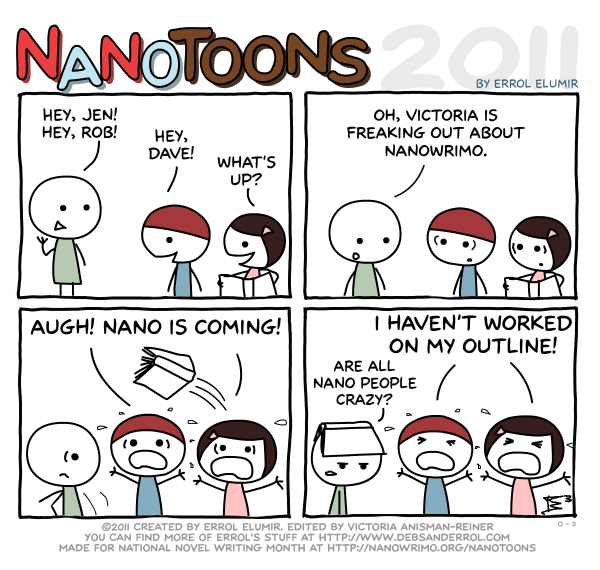 I did NaNo twice and I didn't make it either time. Maybe this is the year I finish! But I can't wait to hear about your progress and what you end up writing about (if you share!). So, so cool.